It’s a well known fact that Stormtroopers are comedy gold. I know Lucas meant them to be menacing, and they are in the context of the Star Wars universe. But take them out of that universe and instant hilarity ensues. 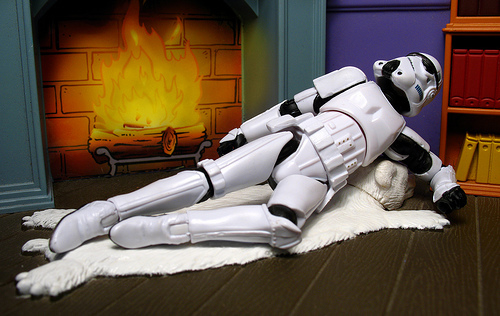 Case in point, a hilarious Flikr photo gallery which has been making the rounds, featuring everyone’s favorite Imperial tools engaged in such exciting everyday activities as washing clothes and laying on a bearskin rug in front of a cozy fire. Yeah that last one is a bit disturbed. I’ve dropped a few image examples of this still photo hilarity after the jump, or click over to Flickr for the complete gallery. Feel like George Lucas raped your childhood? Spend sleepless nights fantasizing ways to murder Jar Jar Binks? Then this is the movie for you. The People Vs. George Lucas documents and gives voice to the fan frustration that’s been building up for the past 10 years, ever since we all sat down, watched The Phantom Menace, and walked out asking ourselves “was it really that bad?” Watch the movie’s first trailer, after the jump. 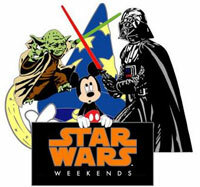 GFR Goes To Disney’s Star Wars Weekends! It’s a safe bet to say if you are a reader of Giant Freakin Robot then you have watched Star Wars. 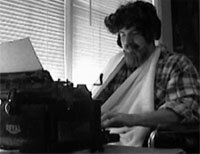 George Lucas’s masterpiece was a pretty big part of my life just like the rest of you geeks. I watched all the movies and I wanted every toy they had although I never got the AT-AT Walker. Screw you, Santa. Anyways, my love of Star Wars never really went away. Of course, I kept it hidden from most people. My wife, Bethany, knew about it, but I made sure not to let her know how pathetic I was until after she was too far invested in me to run away. I’ve always preferred to have my giant combat mech needs filled by Mech Warrior, but I know a lot of you go for its giant robot suit competitor Robotech. Well congratulations, you win. Robotech is being turned into a movie, which means that my dreams of a Mech Warrior film are now almost certainly doomed. The properties are just too similar. 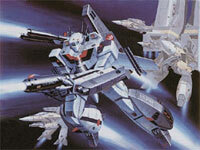 Even better news, the Robotech script is being written by none other than Lawrence Kasdan. Yeah, that Lawrence Kasdan. The guy who wrote Empire Strikes Back, Return of the Jedi, and Raiders of the Lost Ark. Basically, just about any George Lucas movie which was good. If only he’d had the sense to hire him for the prequels… what a better world we’d now be living in. More details on Kasdan’s hiring over at HR. LucasArts Going Out Of Business? Remember the good times you had playing X-Wing on your PC back in the 90s? It was worth the ridiculous amount of effort it took to insert and remove all those floppy disks for installation. 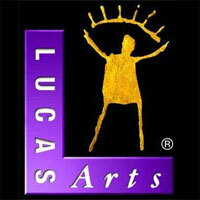 You can thank LucasArts for all those awesome afternoons you had inside the cockpit, and then say adios to them while you’re at it. The game developer has recently fallen on hard times, and hot on the heels of massive layoffs at the company, now there are rumors that they may be going out of business altogether. The rumors come from a place called ShackNews, where they claim to have a reliable, inside source who says LucasArts is shutting down internal development, and any future projects will be outsourced to other companies. When I was a kid I used to stare enviously at all the Star Wars shaped bath products, and wish my mom would let me scrub my back with Chewbacca’s head. She never did, but now we can all relive those Star Wars bathing fantasies (assuming you had them) by washing your hair with an R2 unit! Over at a site called NCS, you can buy R2 unit shampoo dispensers. They look surprisingly good. What’s really kind of neat about it is that you can actually choose which specific R2 unit you want to use. Oddly, none of the choices available is an R2-D2. 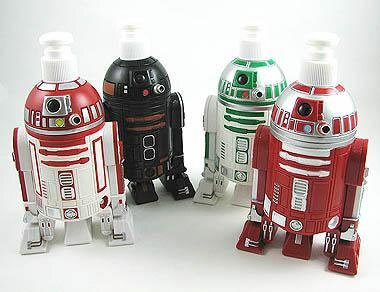 But the dispensers do come in everything from R2-Q5 to R2-P9. If you have to wash your hair, why not wash it in style. Droid style.